Washington (CNN) – The Republican National Committee gave near-unanimous approval Friday to a package of rules changes that would condense the 2016 presidential nominating calendar and help the party avoid the kind of protracted party infighting that dented GOP nominee Mitt Romney's general election appeal in 2012. The changes dovetail with the party's desire to move the convention from late summer to a June window, which would make the next Republican National Convention the earliest convention in either party since 1948. The RNC has announced its support for the June move but will formally vote on the change at a later date. 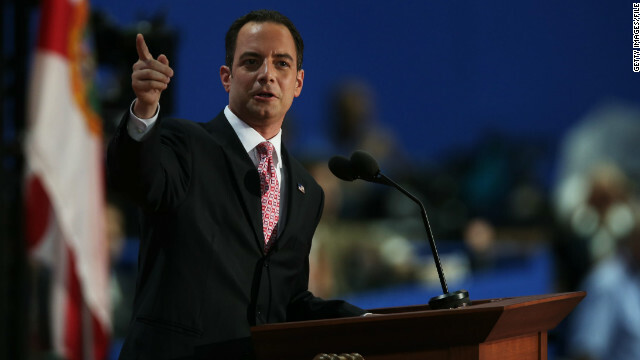 "This is an historic day for our party," RNC Chairman Reince Priebus said after the vote. "We have been saying for months that we were no longer going to sit around and allow ourselves to slice and dice for six months, participate in a circus of debates, that we were going to take hold once again of our responsibility at the Republican National Committee because we are the custodians of the nomination process and today I believe was historical and obviously very important to the future of our party and our country." The party is also taking steps to exert more control over Republican primary debates their moderators, but has yet to formalize any changes. The rules changes, first reported by CNN in December, protect the traditional role of four early voting states while enacting harsh penalties against states that choose to hold early primaries or caucuses in violation of RNC rules. Those first four states – Iowa, New Hampshire, South Carolina and Nevada – will hold their primary and caucus contests in February of 2016. To prevent other states from jumping the order and compelling the first four to move their dates even earlier in January, as they did in 2012, any state that attempts to hold its nominating contest in February would have their number of delegates to the convention slashed to just nine people or, in the case of smaller states, one-third of their delegation - whichever number is smaller. "It's the death penalty," said one RNC member. To wit: If Florida, which has flouted calendar rules in the past, violates RNC rules and holds its 2016 primary in February, its 99-member convention delegation would all but vanish. The state legislature in Florida has already moved to avoid an early primary in 2016. After the first four states vote and the campaigns move into March, candidates would be awarded delegates on a proportional, rather than winner-take-all, basis. The scenario is designed to allow insurgent candidates the chance to stay competitive and prove their campaign mettle in larger states that might otherwise favor better-funded candidates. The early March window would, in theory, prevent a candidate from catching fire in the early states and then riding a wave of momentum to delegate-rich victories in expensive states such as Florida or Texas. States holding a contest after March 15 can decide to award their delegates however they see fit. Of all the changes, the convention date is perhaps the most crucial and sought-after adjustment in the wake of Romney's 2012 loss. For many in the party, the primary process dragged for too long, with too many loose ends and hurt feelings, before Romney was formally declared the nominee at the Tampa, Florida, convention in late August. Moving the convention to June would have the effect of ending the primary campaign in May because of RNC rules that require state party organizations to submit their delegate lists to the national party at least 45 days before the convention. State Republican parties with primaries scheduled for June 2016, including California, New Jersey and New Mexico, would submit their delegate lists to the RNC ahead of time, before any primary vote takes place, Republicans said. For states with Democratic-controlled legislatures that refuse to move their primary dates, the RNC will grant waivers to submit such delegate lists. Handcuffed from spending campaign funds raised for the general election until he was officially nominated in late August, Romney was outspent by a 3-to-1 margin on the television airwaves throughout the summer by President Barack Obama and his allies. Democrats defined Romney early as an out-of-touch plutocrat, and he never recovered his image. By moving the convention to late June, the 2016 nominee will be able to open up his or her general election war chest a full two months earlier. Possible convention sites include Las Vegas, Nevada; Kansas City, Missouri; Columbus, Ohio; Denver, Colorado; and Phoenix, Arizona. The GOP has to change their whole agenda to that of the planet EARTH if they ever want to get elected again EVER!!!!!! This is an effort to hide their true agaenda from the general public. Ha...they are afraid of exposing themselves. Damn, the comedy show is ending early. I will miss 6-9 month's of the candidate's trying their best to out conservative each other then after to everyone gets eliminated they do their best to run to the center erasing everything they previously mentioned. I'll miss Mr. 9-9-9 and Newt "Let them die" and all the other wacky stuff. "There are exceptions. Tom Paine, for example. He and I rarely see eye to eye on anything. But the guy has always been civil in the discourses we've had. The problem is there's not enough like him. The result is what you see happening in this forum – either childish 4th grade banter or the mutual admiration society... neither of which is productive." As you have been civil to me as well. I do enjoy reading the back and forth bantering. Unfortunately, this forum is not conducive to debate. The delay between comments alone stifles most conversations. I wish I could make the same claim, but I have found myself too often on the receiving end of "4th grade" name calling. Oh - but Rudy ... you've given as well as received !! I'm only suggesting here that I am an outsider looking in. Both you and Fair is Fair have had some very lively conversations and I do appreciate a good debate when I see one. The two of you are very, very good at what you do. They have improved the process...next step IMPROVE the candidates. Which may prove to be difficult as long as the moderate Republicans don't participate in the primary process. While I also disagree with some states being put ahead of the others, it's not like the Democrats don't do this, too. They stripped Florida and Michigan of their delegates in 2008 because of moving their primary earlier than the DNC wanted them to have it. Blame Democrats for any and everything that you can, irregardless of actual facts. Democrats had reminded both states of the rules, which called for their votes/delegates being disregarded. Michigan Supreme Court decision ruled that the early primary could go ahead as scheduled, and the DNC later allowed Michigan to seat its' delegates. A later decision was made not to strip Florida of all its' delegates, but rather allow half of them to be seated. They same should have been done to Michigan. It should be pointed out that Republicans did nothing to punish the renegade states in their 2012 primaries.